This morning I woke thinking about my life in work when I was 19. It is amazing how your life builds and you can look back and remember the lessons and skills learned along the way that you still use. 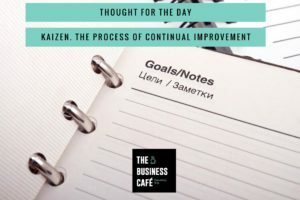 Reflecting on one particular discipline I had when I first started working, made me think about the ‘theory of continual improvement’ that the Japanese are famous for, developed after the second world war, in factories, called ‘Kaizen’. The foundations of Kaizen are about tiny steps, the detail of continual improvement, in culture and working practices. This is certainly true of any sole trader or small business, we all continually improve and constantly seek to learn and be more efficient. Some days we get big wins, some days we wonder why we got out of bed. So back to my 19 year old self….. I started out in telesales, pre the CRM systems of today, 1983, I worked for a Technology Distributor, our products were hardware and software, HP, Microsoft, Intel, IBM etc. Our clients were the 5,000 computer dealers across the UK. We were targeted with calls, outbound selling, it was tough, anyone who has done telesales, knows it is about the skills you have, the quantity of the work you do and the efficiency of the data you are working with, how well you have targeted your ideal prospect list. Each day, 100 calls, listed in a ‘day book’ highlighted if successful, those calls that were listed purely as ‘actions/input’ if no sale achieved. When I closed my day book at the end of each day, I could see the work I had done, the effort I had put in, I could see the point of all my work and the effort I had made, and over time, the momentum grew, my understanding grew, I became more efficient and better at my work. Each day was continual improvement. The critical lesson in this was that I could see my work, at the end of each day, I could see how hard I had worked and I didn’t just judge myself on the wins. To this day, 34 years on, I still list my day. Tick off the things I want to do, pre-listed , my tasks. But I also add all the additional learning’s, significant emails, spontaneous actions, including all my domestic ones, I am a whole person, I can’t let my domestic life fail, just as much as I can’t let my work life fail. At the end of the day, with my G&T, I can see all the effort, I can look back and join the dots of my progress and my thoughts are always on ‘continual improvement’. I guess, I project manage myself, but more than that, I treat myself with the same respect as I would a member of staff, noticing the effort, rewarding and praising my hard work. Always with an eye on improvement, but never with a critical, tough eye on just the wins. As I write this, I think of all these sayings, the ones that sometimes become our mantra. We have just started to use Trello as a Project Management tool, this is great for team planning , accountability and ensuring BIG plans are broken into small steps. However, I will always use my handwritten day-book, my personal ‘well done’ and improvement log. Without this, the days when I am putting in so much and not seeing the immediate return will feel like I am a long way from achieving, when the reality is, I am getting closer and closer and the foundations are deeper and deeper. So, today is about having ways to maintain your #strongmind, ways that you manage your productivity, but also your morale and your energy, being able to see your path behind you so you can see how it has opened up the one in front of you, respecting the back-room work, that builds a business, not just a sale. What about you, do you have ways to keep yourself continually improving, and ensure you can log all your effort? Are you a kind boss to yourself?